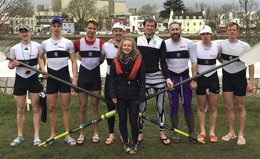 The Tyne senior squads ventured south to the big smoke over 10/11 March 2018 to take on the Tideway, with women’s and men’s heads taking place on the same weekend for a change. The women were up first on the Saturday, starting at number 90. They had favourable conditions and a strong tail wind off the start with Barnes Bridge Ladies pushing them hard. Tyne showed grit and determination, through the choppy water at Hammersmith and finishing in a time of 21:42.2, 76th (and 3rd place in the Medium Club Pennant), an excellent result. The women are looking to regroup and take on the summer season in style. Sunday morning dawned and along with seat rescue from the women it was the men’s turn, starting at numbers 111 and 214. 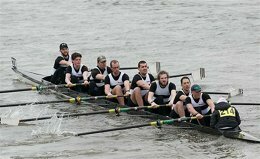 It had been a number of years since Tyne had been able to field two eights for HoRR but with an influx of new members this year we delivered on that expectation. Tyne A finished in a Tyne ARC best ever result of 23rd and a time of 18:42.4, only 2 seconds behind Agecroft RC, winners of the Jackson Trophy. Amazing! Tyne B closed the season-long gap on the A crew finishing 156th in a respectable time of 20:10.1 and Lydia Tridgett, making her tideway debut, steered an excellent course. The whole senior squad would like to thank the coaches, coxes and subs who have made this possible. We look forward to taking this momentum into the summer season. Photo credits: Iain Weir for women's 8+ & Jet Photographic for men's Tyne B 8+.